Construction of PVC monitoring wells can be poorly documented, or documents become lost or records are confusing. Therefore, information is needed to determine what materials were used in well construction or to verify construction according to specifications. This case study examines a 4" PVC constructed well to verify well construction employing the Acoustic Borehole Televiewer (ATV), and to determine if seals were properly placed, absent of channels for migrating fluid passage. 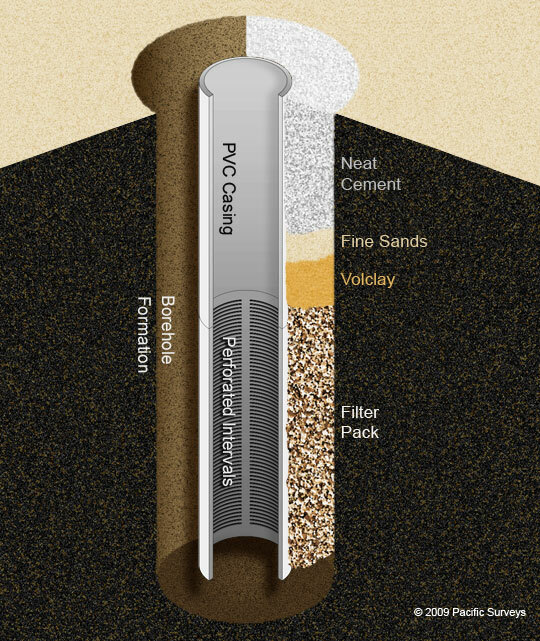 The depiction of the well construction, or "as built" shown in fig 1 has a screen interval with a gravel pack envelope sealed with a volclay layer, accompanying fine sand above the volclay followed by a neat cement seal to the surface. The "as built" needed to be determined and seal integrity verified. The Acoustic Borehole Televiewer (ATV) uses a scanning transducer that emits a high frequency sound pulse normal to the axis of the tool, traveling to the borehole wall, reflects and refracts and returns back to the transducer. The amplitude and travel time of the return signal is measured and presented as an image of the entire borehole (360o) split along an axis and laid flat. In the case of open hole, features such as fractures or bedding planes that intersect the borehole at an angle greater than 0 degress are depicted as a sine wave (fig 2). The amplitude of the return signal is primarily a function of the reflective property of the material encountered: the more rigid the material the brighter the amplitude image. Similarly, the travel time image is brighter with fast travel times, and darker as the travel times are longer in duration. When the ATV is placed inside a PVC well and the software is selected to measure the second arrival generated by the outer casing wall, an amplitude image of the surrounding material can be depicted. In fig 3, the far right image is the acoustic depiction of the casing material occupying the annular space between the casing and the formation. This image is under the column heading of "Amplitude (behind CSG)". Starting with the threaded joint at approximately 152 ft and following the image down, we see that the neat cement appears to be a complete sheath surrounding the casing without any breaks or pockets. There is however, a slight channel on one side running from 150ft to 155ft. The "cement job" appears to be well bonded to the casing and integrity was not in question. At approximately 164.5 ft we encountered the neat cement/fine sand interface. According to the "as built" diagram in the middle track (titled As-Built) the depth of this interface appears to be correct with respect to the ATV. The fine sand extends down to 167.8 ft, slightly shy of the "as-built". Next the volclay plug, that should extend from 168 ft to 169.5 ft followed by the gravel pack that extends down into the screen interval from 173 ft to 188 ft. The interface between the volclay and the gravel pack is depicted by a sine wave indicating that the gravel-pack is placed at an angle to the axis of the well. This could mean that the tubing used to place the gravel may have been located at the apex of the sine wave, leaving a greater amount of gravel-pack on that side of the well. With this added gravel-pack the volclay seal was thinner than shown in the "as-built". The travel time image just left of the amplitude image, illustrates the transit time of the second reflection to return back to the transducer. 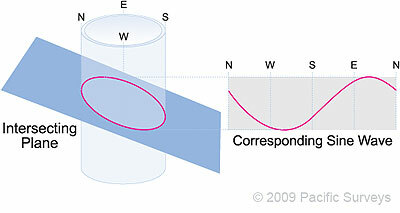 A three dimensional image (3D) is presented on the far left which creates a cylindrical view using the travel time. As can be seen from the Travel Time image, a small channel running from 45o to approximately 110o is displayed in a light tone of gray (also can be seen on the 3D as 'spikes' on the left-side of the image). The Amplitude image labeled "View Inside Casing" is the acoustic image of the first arrival that reflects from the inside wall of the casing. This view helps in verifying well construction. Using the ATV in this manner can assist the Engineer/Geologist in determining well construction and well integrity. Features such as damaged casing, misplaced well construction material and even the placement of centralizers can be ascertained and presented with the "as-built" diagram. If channeling is suspected, or integrity of materials is questioned, using this method can enhance the understanding of the construction. With the ability to look at both reflected sound waves, the depiction of the inside of the casing and the depiction of the surrounding material on the outside can be readily rendered in a manner that visually understood.